I’ve discovered that I love research! When I did research for my first two historical novels The Price of Freedom and Free in the City, I really enjoyed it, but somehow it doesn’t compare to the joy I have as I do research for my latest book Vaucluse. I suppose the difference is because I am researching a real person, Henry Peter Simmons, who lived in Barbados from 1776 to 1843 and who owned Vaucluse Plantation. 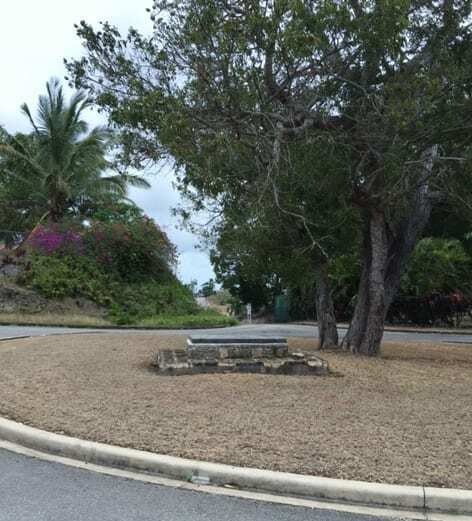 His tomb is in the roundabout in a new development which was part of the plantation (see photo above). Researching is like mining. You have to dig through a lot of useless material to find the nuggets and when you do, it’s like finding gold. I was incredibly excited to find a huge nugget recently. I knew that the plantation had been called Yorkshire Hall before Henry Peter Simmons bought it and I was overcome with the desire to find out why he changed the name to Vaucluse. I would almost have to say that I stumbled upon my gold because when I started to read an account by Dr. Thomas Rolph of his visit to Barbados in 1832, where he stayed at Vaucluse plantation, I was not really expecting to find out why HP ( I call him that sometimes) had changed its name. So I was delighted to discover that on one of their journeys on horseback around the plantation, HP shared with Rolph that when he had first looked over the land its beautiful and wholesome environment with tree-covered hills and lush valleys, moved him to name the plantation Vaucluse after the poet and philosopher Petrarch’s favourite retreat in France. I can’t tell you how happy I was. My task now is to weave that nugget into the story in such a way that befits the treasure that it truly is. I’m off to continue digging for more nuggets which I’ll share with you on my journey of writing Vaucluse. Hope you keep reading the nuggets that I share Sean. I can appreciate the meaning of the name Vaucluse now. Thanks for all your comments. Hope you all tune in as I share more nuggets. Loving this! Telling stories about people who settled in Barbados and why is compelling. Good insights, “Researching is like mining. You have to dig through a lot of useless material to find the nuggets and when you do, it’s like finding gold.” “Here, here” says another researcher! Inset it the truth. That’s so Interesting! I lived at Vaucluse myself for about 5 years with my parents.